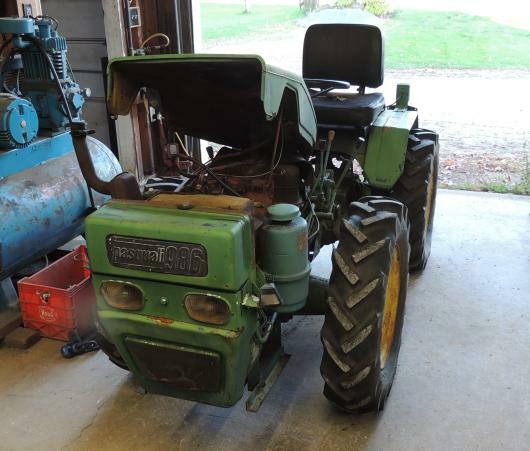 While my experience with my 1938 Farmall F14 has been fun and has certainly pointed out the benefits of having a second tractor, it has also had drawbacks. Mostly they relate to maintenance and starting. Due to the nature of the downdraft carburetor, the F14 is very fussy about it's state of tune, and it doesn't take much to make it difficult or impossible to start. 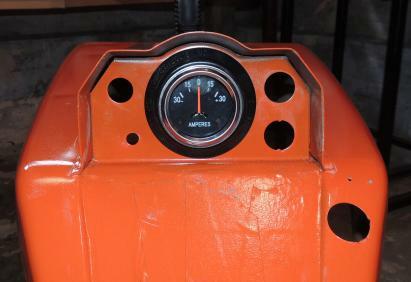 Further, the magneto is very sensitive to damp weather and that also makes it a pain to start. 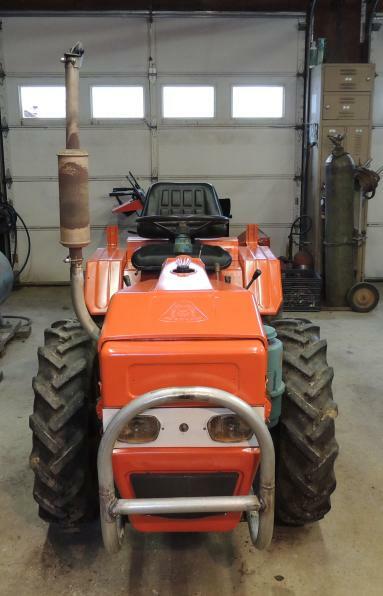 So, I've been casually looking for another, more dependable tractor. Doesn't need to be large or powerful as it will be used primarily for trailer duty, but it DOES need to be dependable and start reliably. I happened to drive by a place that always has a few items with For Sale signs on them parked out by the road, and saw this. I immediately knew what it was, having seen (and marveled over) one some years back. It was the next day before I got a chance to actually stop and check it out. It's an Italian-made Pasquali 986. 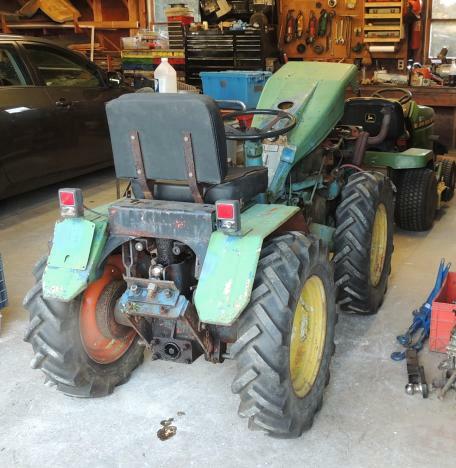 Salient features are full articulation, all wheel drive, a 20HP one cylinder diesel engine, 3 point hitch, 2 speed PTO and a 3 range/3 gear drive for a total of 9 forward speeds and 3 reverses. As soon as I showed up and started looking it over, the guy came out, cranked it up and drove it around a bit as a demo. While he was doing so, I was ciphering out the price I'd be willing to pay. When he got back, I asked him straight out what he wanted for it, and his reply was about 2/3rds of the maximum number I had come up with so I didn't even dicker. I just told him I'd be right back with a trailer and the folding money. I am uncertain of the exact year, and information is a bit hard to come by, but I estimate it is 1970-ish. It did have a few issues that needed to be dealt with pretty much right away. I put a new battery in it, fixed the exhaust, fixed the stop cable (the previous owner had been stopping it using the decompressor) replaced the throttle cable, changed the oil in the differentials and transmission, and serviced the aircleaner. 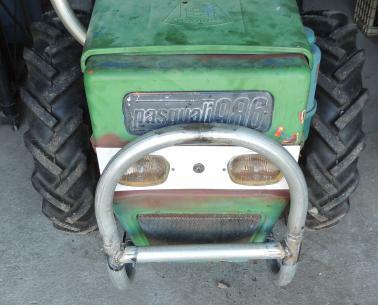 I also built a bumper for the front as it had obviously had run-ins with immovable objects in the past. 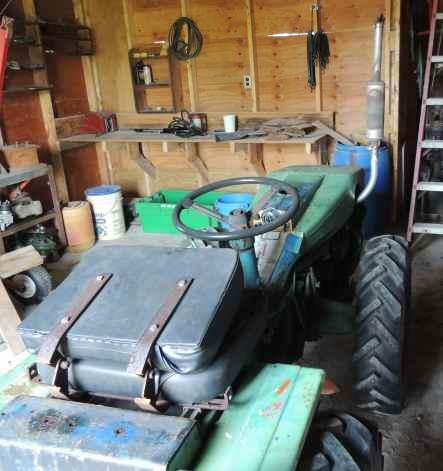 After using/playing with it all fall, I pulled it into the garage this winter to start on some cosmetic repairs. It had at least 4 layers of paint on it, the most recent apparently having been applied with a broom. As far as I can tell, the original color was an off-white, which had been covered with orange, blue and green at different times. The hood had a number of holes crudely punched into it for reasons best known to the previous owner(s). 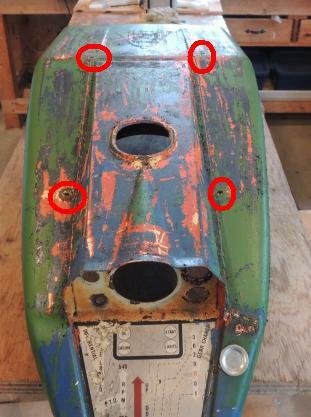 The four noted by the red circles were probably to bolt an old milk crate or some such to the hood for carrying tools. Or beer. Or both. 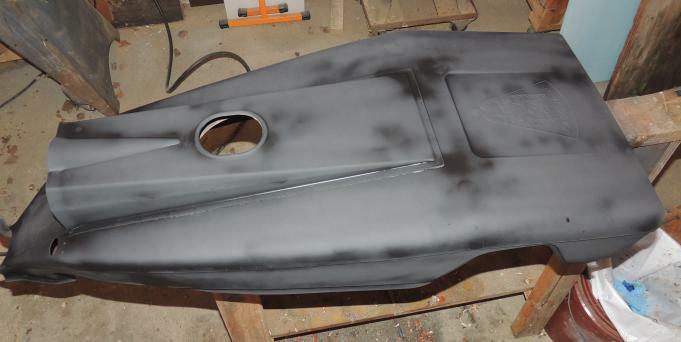 After stripping the paint down to bare metal, I MIG welded the holes shut, ground them down, smoothed them up with a bit of glazing putty and squirted a coat of primer on it. 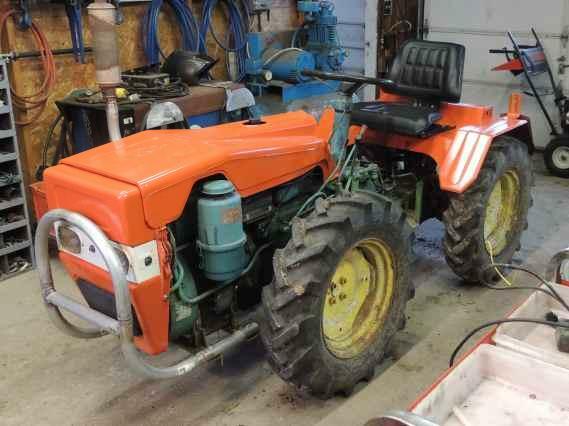 The nose and fenders have gotten the same treatment and all have been shot with a good coat of Allis Chalmers Persian Orange. Why Persian Orange? Because I had a case of it left over from another project.